Officer Justin Schlabach shot and killed an unarmed man for walking toward him and he was granted full immunity and given his job back. 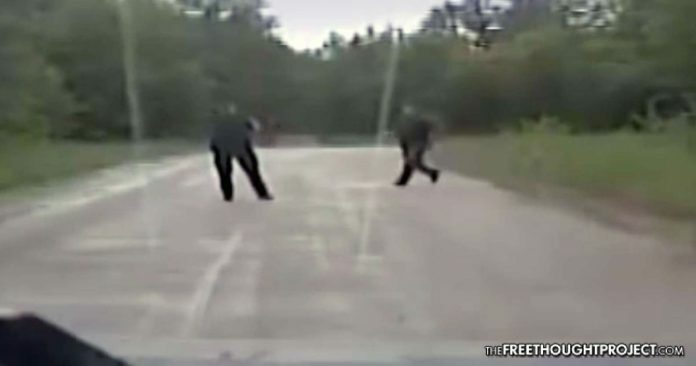 Munising, MI — The parents of a man killed by police are understandably upset after finding out this week that the cop, officer Justin Schlabach, who shot their unarmed son, Timothy Mitchell, for walking toward him will have immunity in the lawsuit. Mitchell’s family sued Munising Officer Justin Schlabach, saying he used excessive force at the end of a chase in 2014. According to TV6, in a 2-1 decision Wednesday, the appeals court said the officer had “probable cause” to believe Mitchell was an immediate threat after the man drove into a ditch. The court says dash-cam video shows Mitchell appeared hostile and took “long, purposeful steps” toward Schlabach. However, the dashcam video shows no such hostility, only a man walking toward a cop. There was one judge on the panel who dissented against granting the killer cop immunity. Judge Karen Nelson Moore noted that jurors should be able to conclude that Schlabach could have chosen another way to subdue Mitchell. And, when watching the video below, it is entirely clear that deadly force was not at all needed at that time. The circumstances surrounding the shooting are extremely troubling. The 46-year-old auto mechanic had gotten into a verbal dispute at an area auto dealership. A call was placed to 9-1-1 alleging that he was highly intoxicated. He was not a wanted felon, nor had he harmed anyone, he simply got drunk and had an argument at work. However, when police arrived, that’s when the situation took a turn for the worse. A police chase ensued but was broken off due to high speeds. At a later point, Schlabach found Mitchell’s vehicle crashed on the roadside with Mitchell standing nearby. Schlabach had a dash cam on his vehicle that was operational at the time, but allegedly his walk around microphone was not working. The video captured on the dash cam shows Schlabach get out his vehicle with his weapon drawn and pointed at Mitchell. The officer claims that he told Mitchell to get on the ground multiple times. An unarmed Mitchell walks towards the officer in a seemingly non-threatening manner. It is at this point Schlabach takes a few steps back before shooting and killing Mitchell. Schlabach claimed that Mitchell told him as he approached that the officer was going to have to kill him. Interesting to note that Schlabach’s audio recording device was not functioning to record any of this alleged interaction between the two. It is also important to note that all Schlabach had to do was walk backward to de-escalate the situation. He could’ve placed the car between him and Mitchell and used the distance for a chance to talk to the man — instead of kill him. Even if Mitchell did tell the officer he would have to kill him, what justification is that for an officer to shoot and kill an unarmed man? There was no attempt by the officer to de-escalate the situation or to utilize the proper force continuum for an unarmed subject. In regards to the prosecutor’s statements regarding committing serious felonies, these felonies would simply be criminal driving violations because they all originated during the chase. To make statements about serious felonies in an attempt to poison the well against Mitchell rings hollow, just like the immunity granted to Schlabach. When watching the video below, ask yourself what business this man has being a police officer. The Free Thought Project will assert that the answer to that question is none. How an unarmed man can be gunned down in the street by an officer who is cleared of any wrongdoing and granted immunity is extremely troubling and a testament to the lack of accountability for law enforcement. The rubber stamping of this killing by the prosecutor and the court shows the system is once again not invested in justice, but only in protecting their own.